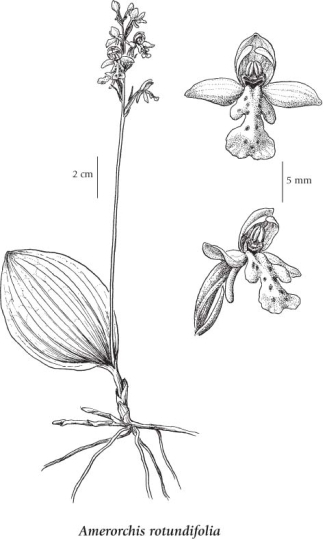 Round-leaved orchis is one of North America's most beautiful wild orchid species. It is found in all Canadian provinces and territories (AB, BC, LB, MB, NB, NF, NT, NU, ON, QC, SK, YT) and in several northern US states (AK, ID, ME, MI, MN, MT, NH, NY, VT, WI, WY) (USDA 2010). It is also found in Greenland. Across its range, preferred habitat varies from limestone barrens and open tundra to coniferous forests, and bogs and moors. In British Columbia, this species is found throughout the province in sun or partial shade in moist forests, on streambanks, and in swamps and bogs in the montane zone. In Michigan, it is described as occurring on "alkaline to circumneutral mineral soil or marl under a Sphagnum moss-dominated groundcover" (Penskar and Higman. 1999). It is reported to favour sites "with a peristent, cold, groundwater source" (Penskar and Higman. 1999). In some areas, this orchid occurs with false solomon's seal (Maianthemum trifolium) and Labrador tea (Rhododendron groenlandicum). Round-leaved orchis is a perennial rhizomatous species. Plant are distinctive, with a single ovate basal leaf, and up to 15 showy pink to white hooded, spurred flowers (about 1 cm in height) with (usually) purple or dark red spots. Plants may be up to 35 cm in height. Flowering period ranges from late June through July across its range, although it has been photographed in flower as early as June 9. The earliest specimen record of this species in the UBC Herbarium is from Ingenika River in 1914, collected by George V. Copley. Perennial herb from short rhizomes, with fleshy, fibrous roots; stems 10-20 cm tall, leafless, smooth. Single, basal or nearly basal, round to elliptic, smooth, 3-7 cm long, 2-7 cm wide, unstalked or nearly so. Inflorescence a few-flowered terminal raceme of showy flowers; sepals and lateral petals whitish to pink; sepals 3- to 5-veined, narrowly egg-shaped, 6-10 mm long; petals 2- to 3-veined, narrower than sepals, 5-6 mm long; lip 5-10 mm long, 3-lobed, the terminal lobe much larger, white with purple to dark red spots, the spur 3-7 mm long. Capsules, ellipsoid, about 15 mm long. Moist, mossy forests, streambanks, swamps and bogs in the montane zone; infrequent throughout BC east of the Coast-Cascade Mountains; N to AK, YT and NT, E to NF and S to ME, MI, WI, MN, WY and ID.